Disability Rights International (DRI) calls on our US supporters to take immediate action to push for Senate ratification of the UN Convention on the Rights of Persons with Disabilities (CRPD). “We at DRI have fought against torture, abuse, and segregation of people with disabilities throughout the world. The United States will be in a much stronger position to take a stand on the rights of children and adults with disabilities – at home and abroad – when we hold ourselves to the same standard as other countries,” said Eric Rosenthal, DRI’s Executive Director. We are close to achieving our goals – we must sway just a few more votes in the Senate! Your Senators need to continue to hear from you and know that you support the CRPD! Show the community is behind this treaty. Visit the US International Council on Disability’s citizen action portal to call your Senators! They need to hear from our movement now. Around the world, 147 countries have already ratified the CRPD. 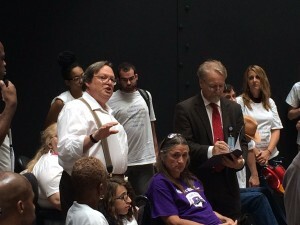 Disability Rights International Executive Director Eric Rosenthal speaks at a July 30 Senate rally in support of UN Disability Convention. 147 countries are on board — but not the USA.